Maryanne with five amazing activists whom she met on the WESPAC bus from Westchester, NY. Next Sunday, three OAS members will be making the trip tp Washington to participate in what may be the largest climate rally in history. 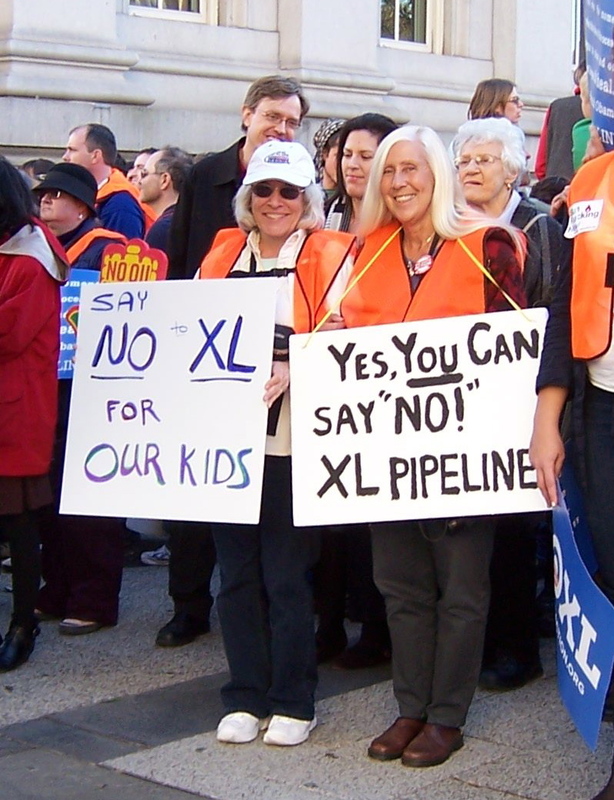 David and Janet Muir and I will be joining thousands of other concerned citizens who want to convince President Obama to reject the Keystone XL oil sands pipeline. It is time for him to take action on climate change and to prove that he is for real about it. The President has the power to stop this project – if he wants to. global warming due to the high carbon intensity of tar sands sourced oil. The approval of the KXL pipeline would speed up tar sand development because even more gallons of tar sand oil would have somewhere to go. 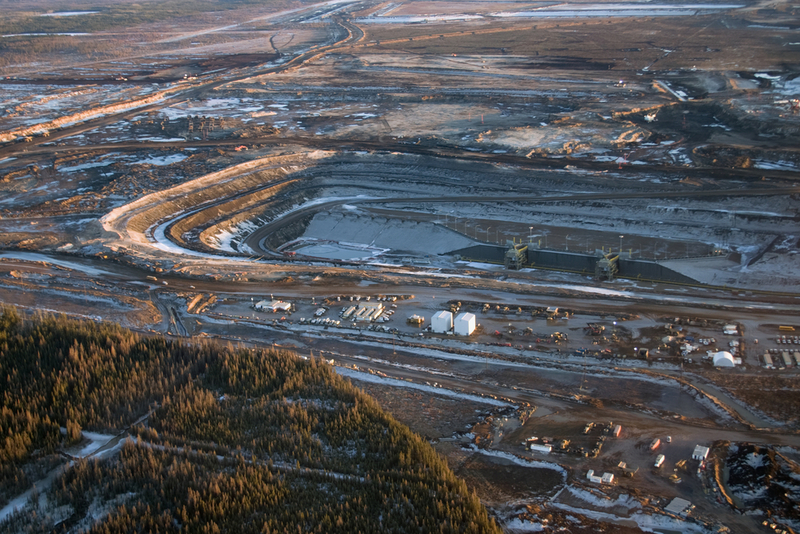 In addition to ecosystem destruction, tar sand development in Alberta is threatening thehealth and the way of life of the indigenous people of the area. Cancer, renal failure, lupus, and hyperthyroidism are on the increase in people downstream from tailing ponds(http://www.foe.org/projects/climate-and-energy/tar-sands). 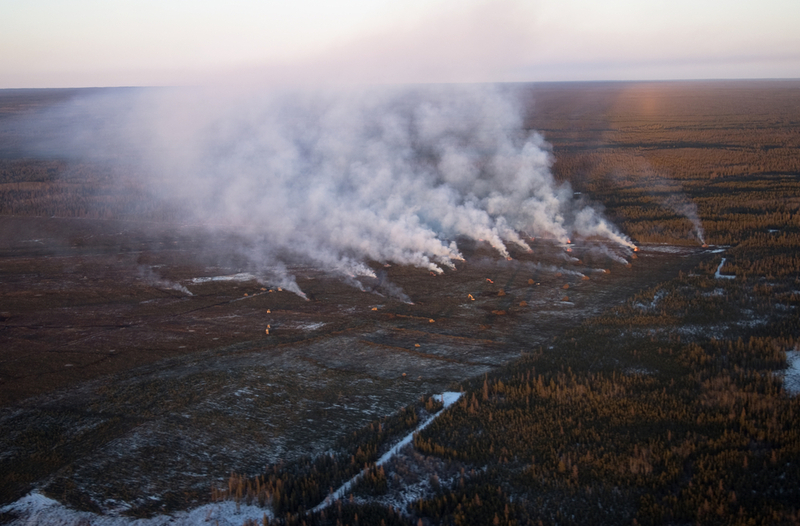 For me, the destruction of boreal forest and the potentional annihilation of species that require this habitat for survival was enough to turn me against it. In closing, I wish to refer the reader to an article in The Nation that explains how President Obama’s decision about the KXL pipeline could affect the future. Michael T. Clare explains how in his convincing article: Keystone XL: A Presidential Decision That Could Change the World. I think he is absolutely correct. I don’t know if my presence at the Forward on Climate rally will make a difference to President Obama, but knowing that I tried to do something will make a difference to me. According to the National Resources Defense Council Staff Blog, the Keystone XL pipeline will NOT improve the U.S. oil supply. At the present time, Canadian oil goes to refineries in the Midwest where the United States is their only buyer. If the Keystone XL pipeline were built, Canadian oil would no longer be processed for use within the United States. Instead, the crude oil would be diverted to refineries on the Gulf Coast, many of which are in free trade zones. Oil refined in these zones may be sold to foreign countries without paying U.S. taxes (switchboard.nrdc.org, 12/20/11). Valero, a potential buyer for a large amount of Keystone XL oil, has informed its investors that it plans to export the oil the pipeline would carry to the Gulf Coast. In order to justify the construction of the Keystone Xl pipeline, the U.S. Congress tried to persuade TransCanada to agree to a requirement that oil transported by the pipeline be used in the United States. TransCanada refused, fearing repercussions when refineries backed out of their contracts. Valero has already told its investors that “its future business is in international exports” (switchboard.nrdc.org). After investigating the effect that the Keystone XL pipeline would have on future energy supplies for the country, the Department of Energy concluded that “the United States will import the same amount of crude from Canada through2030 whether or not the Keystone XL is built” (switchboard.nrdc.org). Estimates for the number of jobs that would be created by the construction of the TransCanada Keystone XL pipeline vary greatly, depending upon who is doing the estimating. A posting by Glenn Kessler sheds some light on how these calculations are made. TransCanada Corp claims that 20,000 Americans could be put to work constructing the pipeline and with an additional 118,000 spin-off jobs due to increased local business for local restaurants, hotels, and suppliers. However, this estimate might be inflated. For example, using the “one person, one year” method of calculation, a projected total of 13,000 jobs means that 6,500 people would be employed for two years. The State Department’s final estimate is that building the pipeline would result in 5,000 to 6,000 construction jobs (www.washingtonpost.com/blogs/fact-checker/post/keystone-pipel, 12/14/11). Read what Mike Klink, civil engineer and former employee of Bechtel (a company employed by TransCanada) has to say about how he lost his job after raising safety concerns when he saw corners being cut during the construction of TransCanada’s first pipeline. (www.journalstar.com/news/opinion/editorial/columnists/mike-klink-key, 12/31/11) Mr. Klink is currently seeking whistleblower protection from the U.S. Department of Labor.